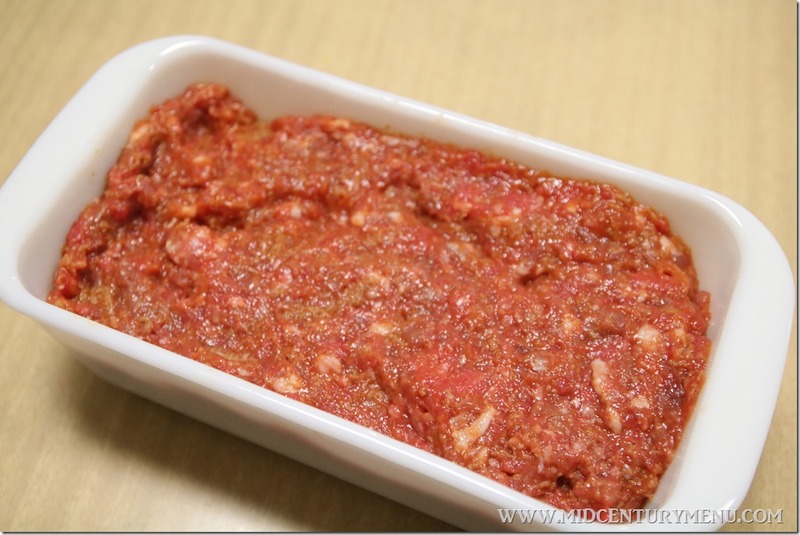 This week we are making meatloaf! This is Jubilee Meat Loaf! Combine eggs, ¾ cup condensed soup, and ¼ cup water. 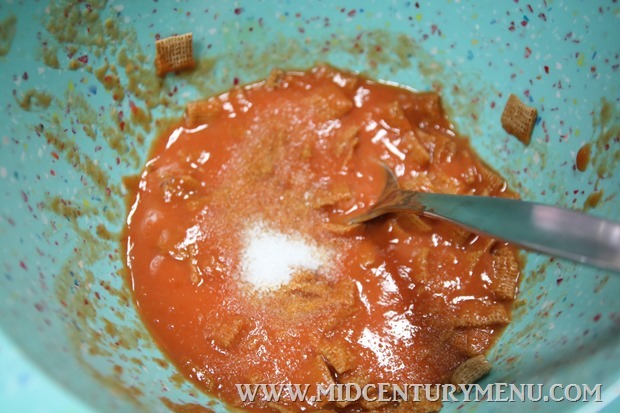 Add Wheat Chex. Let stand 20 minutes, do not stir. Add meat, salt and onion. Mix well. Pack into loaf pan. Pour 2 tablespoons water over top of loaf. Bake for 1 hour and 15 minutes. 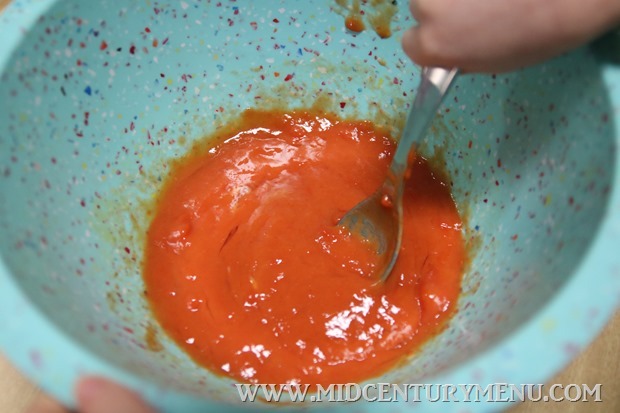 Serve plain or with tomato sauce made by heating reserved soup with 2 tablespoons drippings from loaf. This is from the Ralston pamphlet, Recipes From Checkerboard Square from 1959, which contains a bunch of recipes that have lots of cereal in them. It’s pretty great. But honestly, Alex chose this week’s meat loaf. Ever since Zucchini Weenie, she’s been a big fan of anything that has a can of tomato soup in it. Tom’s choice for this week was a cheese and bean loaf. I wanted to make them both, but ran out of time. But no worries, Tom’s bean loaf will probably make an appearance in a few weeks for Lent. But I can’t say I was sad to make this. Growing up, my mom’s meatloaf was always made with stale crackers, like Ritz or Club crackers, and never plain breadcrumbs. 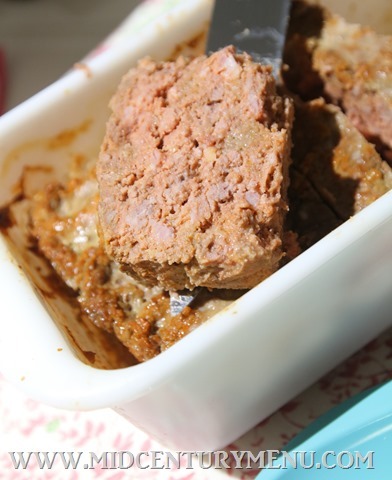 It always gave a really interesting flavor to our meatloaf. I was 12 when I realized that if you changed the kind of cracker you used, you changed the flavor of your meatloaf. This was very exciting for me (culinary nerd already) and I still get exited to use different fillers in meatloaf to see how they affect the flavor (still culinary nerd). I have to be honest, I’ve never used or thought of using Wheat Chex. 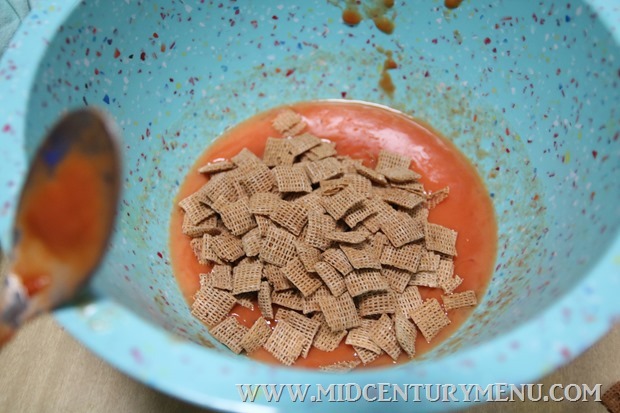 But I was excited by the idea, because this is another cereal where the last two cups hang around in the box (after making Chex mix) until I have to throw it out. And now that I’ve found a use for the last of my Rice Krispies, I’m all about finding uses for other cereals that tend to stick around. All wet and gloppy after the soaking time! The waiting was actually really hard for Alex. Up until this point she stirred everything, so I kept catching her coming back and trying to stir during the soaking time. I felt bad the second time I had to chase her off, so I gave her a cookie to keep her busy. She promptly lost interest in stirring. Meat! So red. So, so red. Disconcerting. All done and ready to eat! This was actually a super-interesting loaf. The Wheat Chex combined with the sausage pretty much took over in the flavor department. Which was a bit strange, because there was not that much sausage in it. 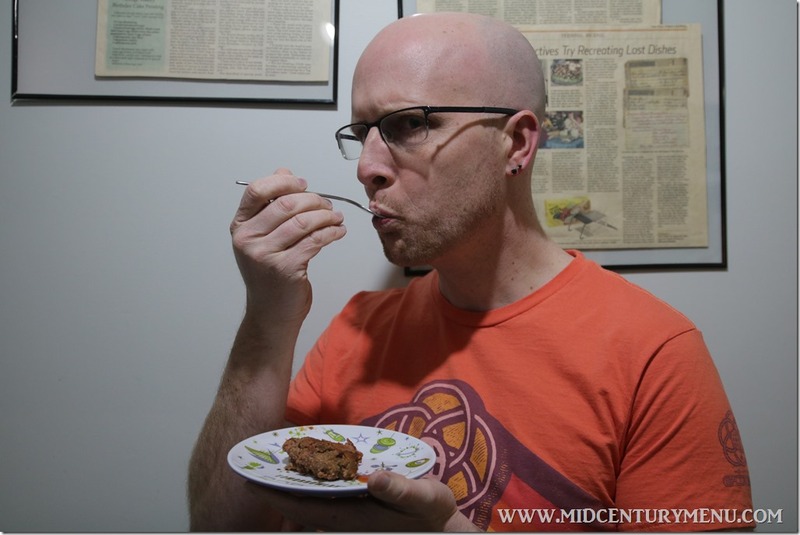 I thought it would just taste like a meatloaf, but it ended up tasting like breakfast food. Like a breakfast meatloaf. Which I thought was kind of cool. I served it with the usual meatloaf sides, but I think it would totally taste better with eggs and hashbrowns. Of course, if breakfast isn’t your thing, you can sub the sausage out with italian sausage or a brat or something. Another interesting side note: The condensed tomato soup mixed with the drippings tasted waaaay better with the meatloaf than ketchup. Which is a first. How very brunchy! I feel like if I was the kind of lady who was into church potlucks, this would be a fun thing to bring to a morning church potluck. We actually were a Wheat Chex family, so we didn’t have to worry about them getting stale. My mom used to melt chocolate chips and mix in Wheat Chex and raisins and then drop them by spoonfuls on waxed paper to have around if company dropped by. Interesting! Thank you for the recipe. 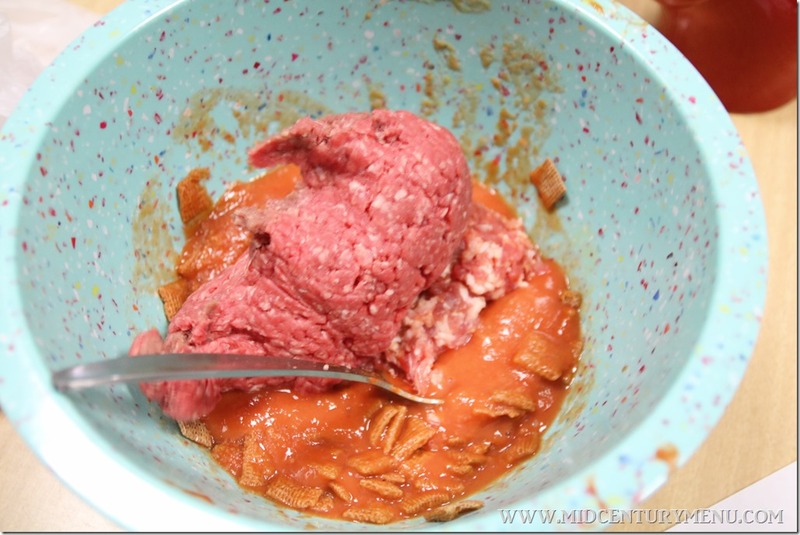 I always wondered how meat loaf would taste with cereal. The only thing I would hesitate to do would be use stale crackers or cereal, I feel even with strong seasonings, the stale taste might still come through. We do love our meatloaf any way we make it. I have done this with corn flakes. I thought you were supposed to crush them into crumbs, not leave them whole. I love the sound of a breakfast meatloaf. I might have to make it just to announce to my family that we are having breakfast meatloaf. Hi Ruth, It’s Marita from your MC Facebook group. How is this for a whacky coincidence. It’s a rainy winter day here in the Philly ‘burbs and that makes it a perfect day to make my usual meatoaf with potatoes and carrots dinner. Real comfort food. Lightbulb moment when I realized that the recipe that I have been using is from a cookbook I bought in the 80s when I was in my 20s. 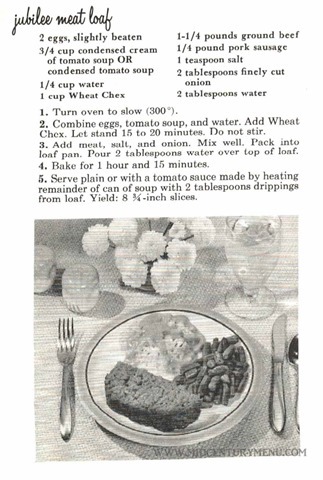 The cookbook is “Even More Recipes from the backs of Boxes, Bottles, Cans, and Jars” with a publish date of 1982. I bought it because my mother remarked that recipes on packages are usually very good. I thought I’d post it to the group but wasn’t sure the 80s was Mid-Century enough. 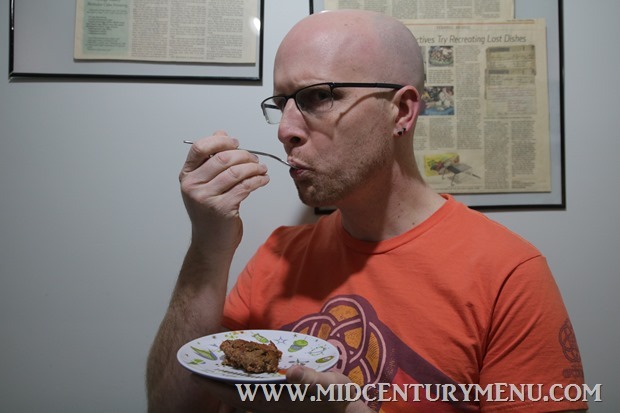 Then it occurred to me that the concept of using Wheat Chex as a meatloaf binder might actually be older so I thought I’d google around to see if that were true. I got this page as the first hit! 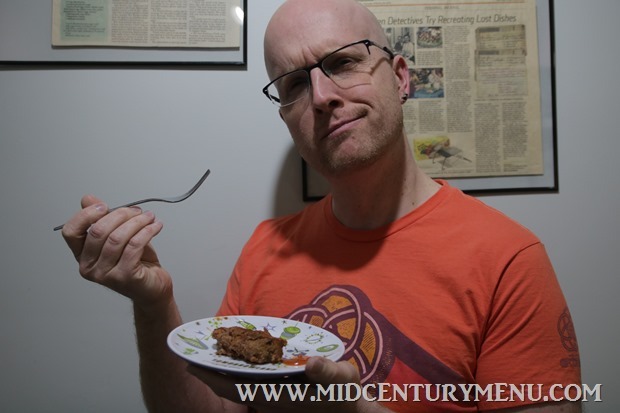 So later on today I’ll be posting a picture of my meatloaf along with the smudgy page of the cookbook. The recipe from my cookbook is slight different but still…..Wheat Chex! 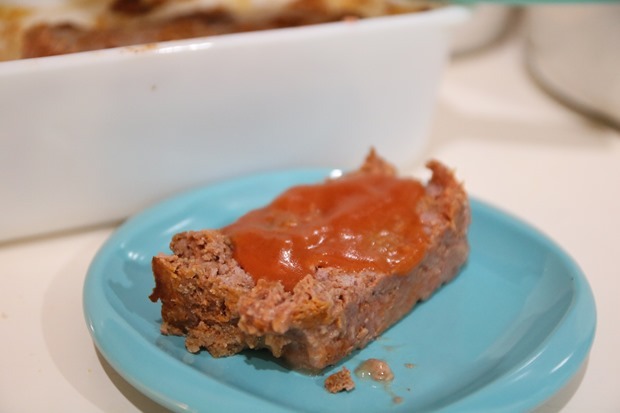 By the by, I’ve only ever made my meatloaf using this recipe and my family (as well as anyone else who I’ve served it to) absolutely loves it. 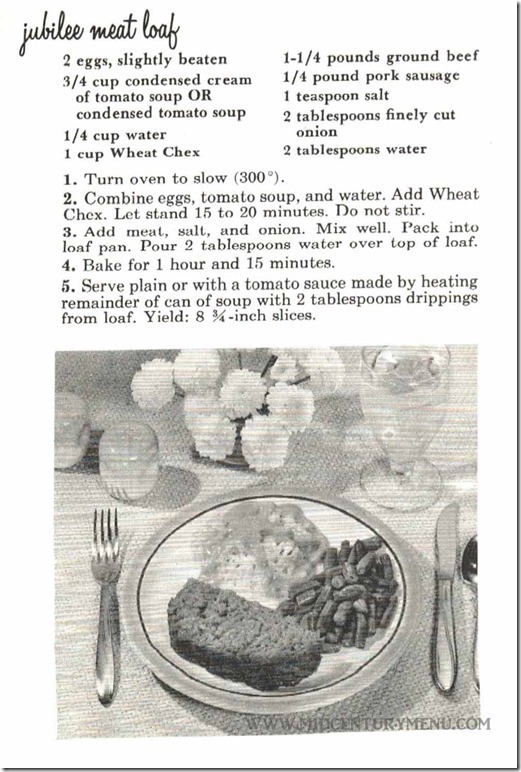 I grew up with meatloaf made with crushed saltines. I didn’t start using breadcrumbs until a few years ago when I had a day that there were no saltines in the house. I find that the crushed saltines actually make a lighter loaf than breadcrumbs. 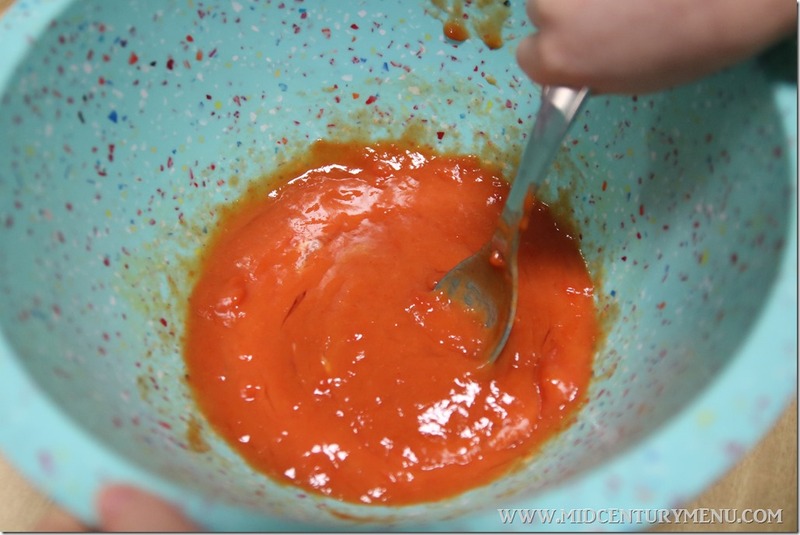 And I always use tomato sauce in mine so it’s always that color.